Johns Hopkins molecular biologist Se-Jin Lee made the discovery that has inspired a class of drugs whose likely abuse will unleash the potential for massive muscle development with little effort. In 1992 Korean American genetics researcher Se-jin Lee led a Johns Hopkins team that discovered myostatin, a protein present in muscle tissue. Within five years it was able to show that the presence of myostatin limits the division of muscle cells, both prior to birth and after birth. By knocking out the gene that codes for myostatin, Lee’s team bred mice that quickly developed two or three times the skeletal muscle mass of ordinary mice. Strikingly, the loss of the gene had no impact on non-skeletal muscles like the heart or the intestines, enabling the breeding of otherwise healthy farm animals that could develop far larger quantities of meat. Lee’s discovery also prompted a search for myostatin inhibitors that might help victims of muscle-wasting diseases like muscular dystrophy, cancer or kidney disease, or even those suffering from muscle atrophy caused by inactivity following severe injuries. Now several statin-blocking drugs are set to receive FDA approval. Their imminent arrival on the market is seen as heralding a new era of abuse of performance-enhacing drugs by athletes and body-builders. A similar phenomenon occurred after the release of the anemia drug EPO which promotes the production of red blood cells. Lance Armstrong heads up the long list of athletes known to have abused EPO to enhance athletic performances. HGH is another growth-factor drug that has been abused by legions of athletes, including Alex Rodriquez. Observers speculate that once bodybuilders get a glimpse of the super-beefy Belgian Blue Bulls, a variety of beef cows bred to lack the myostatin gene, they will swarm to the new myostatin inhibitors. Lee himself recognizes the huge potential for abuse of myostatin inhibitors. “You only have to look at those mice for 10 seconds to realize not only the potential to treat patients, but also the potential for abuse,” he said, referring to the muscular mice bred by his laboratory to lack the myostatin gene. Se-Jin Lee received his bachelors degree in biochemistry from Harvard before going to Johns Hopkins for his MD and a PhD in molecular biology and genetics. Upon graduation he served as a staff associate at Carnegie Institution’s department of embryology before returning to Johns Hopkins as an assistant professor in 1991. He became an associate professor in 1997 and is currently a full professor. 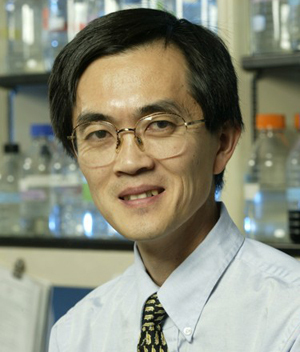 Professor Se-Jin Lee is the Johns Hopkins molecular biologist who discovered the role of myostatin in limiting muscle growth.